Skywatcher Giuseppe Petricca took this image of a "supermoon" total lunar eclipse on Sept. 27, 2015, from Pisa, Italy, about 2 minutes prior to the beginning of the totality phase. 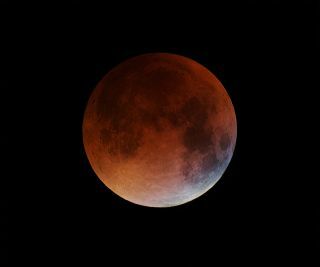 Today's total lunar eclipse is dazzling people across half the planet, but what can you do if you're on the wrong side of the world, and how much time do you have before it's too late? Here's what you need to know to make the most of the July 27 phenomenon. First of all, act fast: The eclipse today peaks at 4:21 p.m. EDT (2021 GMT). Totality — when the entire moon is dyed red by the Earth's shadow — will continue until 5:13 p.m. EDT (2113 GMT). If you're located in the Americas, you won't be able to see the event for yourself, so you'll want to take advantage of one of the several livestreams being shared around the globe by astronomers and observatories in the U.K., Italy, Israel, Namibia and more. And if you miss totality, don't panic; there's still more to see. There's a second celestial spectacle on today's docket, the opposition of Mars, in which the planet will appear incredibly bright as it sits directly opposite the sun. And of course, the moon will slowly creep out of Earth's shadow, gradually returning to its usual silvery self.